Hot summer days and long evenings are the perfect time to take advantage of Santa Barbara’s best events and activities. Check out some of our favorite places and tips for enjoying the coast in July. We included as much helpful information as possible, including both free events and some with fees. If we missed something, feel free to add details in the comments section below. Hope you are enjoying your summer, exploring the beaches and having lots of family fun! Stand Up Paddle Lessons – available most days in July. Enjoy a unique view of the American Riviera while enjoying an ocean sport quickly becoming a favorite among locals. Most tours see wildlife including sea lions, seals and sea stars. Santa Barbara Botanical Gardens – Tours are scheduled on weekends at 11:00 a.m. and 2:00 p.m. and are included in admission. Tours are led by a knowledgeable docent and generally last for one hour. Join the Rare Plant Treasure Hunt: Mariposa Lily on July 14th as you hike from Tunnel R. up to the famed Inspiration Point. Space is limited, so be sure to reserve ahead of time. 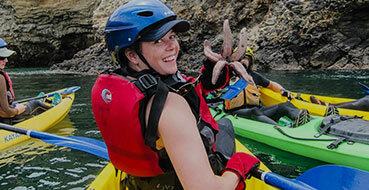 Channel Islands National Park Kayaking Tours – available every day in July. Kayak and explore this remarkable ocean environment. Only 20 miles off the California Coast, the Channel Islands isolation over thousands of years has created unique animals, plants and birds found nowhere else on Earth. Come explore the beauty and richness of California’s Channel Islands. Painted Cave Kayak Tour – JULY: 7/5, 7/7, 7/10, 7/13, 7/17, 7/26, 7/27, 7/28 & 7/31 Venture into one of the largest sea caves in the world. This three-hour tour of some of Santa Cruz Island’s best sea caves is accompanied by free time for snorkeling and plenty of opportunity for wildlife viewing. Enjoy breakfast and lunch on the two-hour boat ride out to the island while keeping an eye out for dolphins and whales in the channel. A fun, all-inclusive day! Learn To Surf – available most days in July. Experience the waves of the Pacific Ocean with our surf instructors who have over 25 years of experience. Find the best local breaks in the area while mastering the fundamentals of one of Santa Barbara’s favorite past times. Explore the Funk Zone or Presidio, Santa Barbara’s foodie neighborhoods, through your taste buds and camera lens with Eat This, Shoot That! Spend an afternoon savoring amazing food or sipping top-shelf wines while learning food and travel photo tips from a pro tour guide/local foodie. 27th Annual S.B. French Festival – Oak Park transforms into a French Village with all the sights, sounds, aromas and flavors that Paris has to offer. You can even enjoy a poodles and pals parade! Saturday July 14th and Sunday July 15th, 11am to 7pm. Santa Barbara Arts & Crafts Show, Every Sunday – Approximately 300 Santa Barbara County resident artists come to display their own works in an informal atmosphere under the palms of seaside Chase Palm Park. All items are original art, created by the artists you meet. Every Sunday from 10 a.m. ’til Dusk. Fun Paddle – available most days in July. $55 per person. Join us for a relaxing introduction to kayaking where we’ll take a 2 hour paddling adventure around Santa Barbara shoreline. This tour is the perfect half day activity, and a great introduction to the exciting sport of sea kayaking. Fun and affordable for the whole family! Downtown Santa Barbara Farmers Market – Come down and buy local fresh vegetables, fruits, flowers, small plants and specialty items. Street musicians, music and downtown shops and restaurants. Year round, rain or shine. Corner of Santa Barbara and Cota Streets on Sunday and on State Street (500-600 bocks) on Tuesday. Every Saturday and Tuesday 8:30 a.m. – 12:30 p.m/4:00pm – 7:30. Please add events and activities that we may have missed in the comment section below. July indeed seems like an ideal time of the year to visit Santa Barbara and enjoy the fun adventures. I won’t be able to explore it this year, but next year it will be my top summer destination. Thanks for the suggestion!